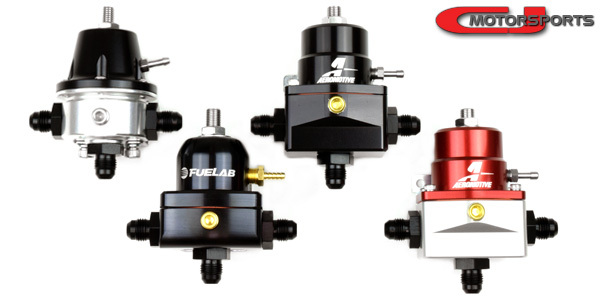 Regulator Type: Select your preference from Aeromotive and Fuelab options. DEI Fire Sleeve: This quality insulation for -6 hoses is recommended for turbo and high-heat applications. Mini Fuel Pressure Gauge: When not installing an in-cabin fuel pressure gauge, you will need this to set and monitor fuel pressure. CJ Motorsports Billet V.FE FPD Rails: Our 4th model of fuel rails for the VQ35DE features a larger bore, integrated FPDs, and fuel injector retention clips. Includes all required stainless steel hardware for installation. 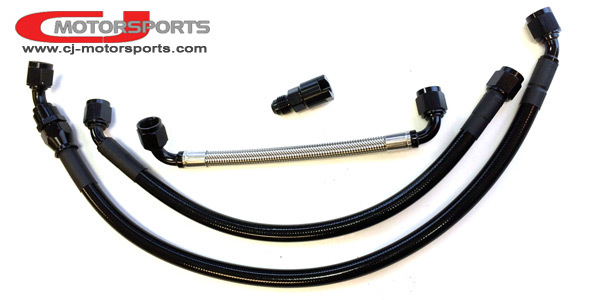 S2 Plumbing Kit: Every inch of plumbing is upgraded with the S2 system, beginning directly at the fuel pump housing. A billet fuel pump output fitting is used to adapt the factory QD to -6an. The fuel pump output hose leads from this fitting to underneath the vehicle where it feeds the -8an stainless feed pipe. Our feed pipe features twice the internal surface area of the factory pipe, making it a key component in pressure drop reduction. A parallel rail feed hose assembly, constructed of a large -8an hose with a billet Y-Block splitting to twin -6an, routes the fuel feed up the transmission case and to the rear of the engine, and avoiding the close proximity to the exhaust manifolds of the factory routing. Individual rail return hoses lead to the regulator, and back to the tank with a single -6an. Fuel Pressure Regulator: Choose your preference from 3 optional regulators that we stock. Each adjustable regulator has opposing side inlets with a downward facing outlet. They can be installed with no vacuum line for a static rail pressure setting, or connect a vacuum reference line for a continuous rail pressure differential (1:1).